DALLAS (AP) — It was the kind of shooting that had spurred national interest before: A police officer had opened fire into a vehicle, leaving a black man dead. For residents in the Dallas area, the Sept. 1 killing of 24-year-old O’Shae Terry in Arlington brought to mind the shooting of Jordan Edwards in another Texas city last year. The 15-year-old Edwards and four other black teenagers were in a car and leaving a house party in Balch Springs when a white officer shot into the moving vehicle, killing the high school freshman who was in the front passenger seat. The officer was fired and, in a rare move, convicted of murder and sentenced to 15 years in prison. The shooting, like Terry’s, highlighted a use-of-force tactic that law enforcement experts say is dangerous: firing into a moving vehicle. Five days after Terry’s shooting, police released footage and the case was starting to gain momentum. But hours after the video images of Terry’s fatal traffic stop made headlines, attention was already turning to the Sept. 6 shooting of another black man, 26-year-old Botham Jean, a St. Lucia native killed by a white off-duty officer who lived in the same Dallas apartment complex as him. The shooting resonated with people in a way that Terry’s didn’t. Jean had not been pulled over by police, but instead was gunned down in his own home by an officer who said she mistook Jean’s apartment for her own. To Terry’s mother, Sherley Woods, it’s hard not to see the similarities in the deaths of her son and Jean. Activist and writer Shaun King said the nation only seems willing to focus on one police shooting story at a time. And in a news climate dominated by coverage of President Donald Trump, he said it’s more difficult to attract national interest for stories of police brutality. “It became really, really difficult to get those stories told,” he said, adding that everybody would be talking about Terry’s killing had it happened in 2014. Attorney Lee Merritt, who represents the Terry and Jean families and has handled other police shooting cases, said Jean’s death overshadowed the video footage of Terry’s killing, but the officers in both shootings should be held accountable. “At no point did that car represent a danger to (the officer who shot Terry),” Merritt said. He said the Arlington officer should be fired and criminally charged. William Terrill, an Arizona State University professor who studies use of force, said shooting at a moving vehicle is extremely risky because an officer could miss his target and shoot a bystander, or he could shoot the driver and cause the vehicle to become out of control. “It’s really hard to hit a moving target,” Terrill said. 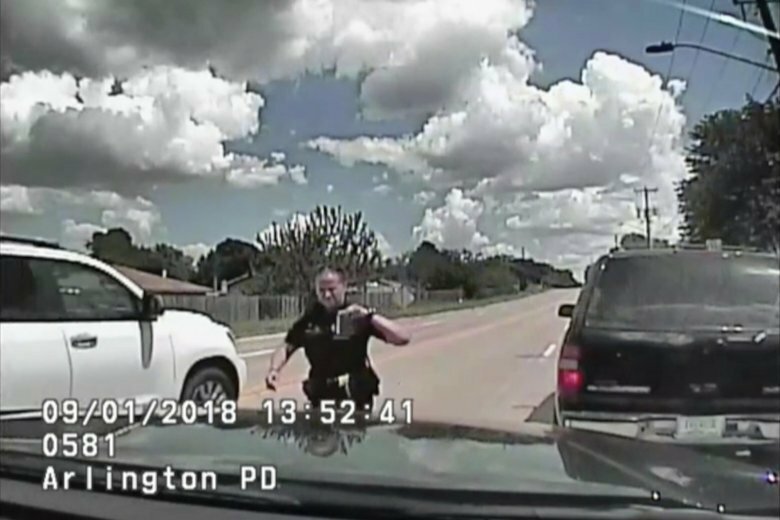 The police footage, which consists of both body and dashboard camera videos, shows an Arlington officer chatting with Terry and his front-seat passenger after pulling the SUV over for a vehicle registration violation. A second officer, responding as backup, arrives and approaches the passenger-side door. The first officer tells Terry and his passenger that she smells marijuana in their vehicle and needs to search it. The first officer then heads back to a patrol vehicle. About three minutes later, the SUV’s windows start to roll up and the backup officer grabs onto the passenger-side window and tells Terry to stop. The SUV moves forward as three shots ring out. As the vehicle continues moving, two more shots are heard. The officer who initiated the traffic stop did not open fire. Terry’s passenger was detained but later released. Arlington police have not identified the officer who shot Terry except to say that he has been with the department for eight years. A police spokesman, Lt. Christopher Cook, said in a statement Wednesday that the department isn’t naming the officer because of concerns for his safety. Cook said the officer’s gun and badge have been taken while an internal investigation continues and he’s been assigned a role in which he has no contact with the public. The day after the shooting, police reported finding a handgun, ecstasy pills and more than a pound of marijuana in the SUV. Merritt said the officer who killed Terry was not aware of the gun and drugs when shooting him. Terry’s mother said her son posed no threat to the officers and the shooting wasn’t justified. “It was wrong. There’s no other way you could look at it,” Sherley Woods said. She acknowledged Terry had a criminal record but said his past had nothing to do with the shooting. She said Terry, who was her youngest son, had many positive qualities. She said he was a loving person and spoke of becoming a police officer when he was younger. Terry enjoyed fixing up cars and would repair his friends’ vehicles, his mother said, adding that he was known to pay for the parts himself. He had a job helping supply trucks with diesel fuel, she said.